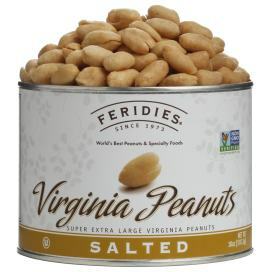 A true classic and staple for 45 years, our best selling, super extra-large Salted Virginia Peanuts deliver that award-winning taste in every roasted, lightly salted bite of pure peanut flavor. 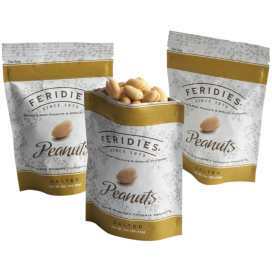 Our Salted Virginia Peanuts are available in a variety of sizes and designs for your personal enjoyment and any gift-giving occasion throughout the year. While the peanut may be a legume and not a true nut, it's still a valuable part of any diet. Whether you prefer low-carb, low-fat, or raw food only, salted nuts can play an important role in keeping you healthy and helping you reach your fitness or weight loss goals. These little packages of healthy fats and powerful proteins may look humble, but they're a tasty way to stay well-nourished while enjoying the satisfaction of fulfilling your urge to snack. Peanuts do contain plenty of fat, but it comes in form of heart-healthy monounsaturated fat. Combine this with the antioxidants packed into the legumes and you've got a double dose of heart support. Niacin, vitamin E, and folate all promote muscle recovery and healthy muscle function at the same time, aiding both athletes and sedentary snackers. In fact, eating peanuts may even lower your risk of developing gallbladder stones. Aside from these specific functions, they also supply about a quarter of your daily protein requirement and only 3% of your daily carbohydrate requirement while packing in 3 grams of fiber per quarter cup. You can't find nutrition like that in just any snack, and salted peanuts still offer the same savory flavors as a less healthy alternative. 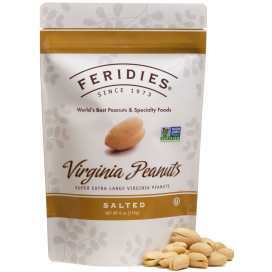 There are even more benefits to salted Virginia peanuts from FERIDIES when you're searching for a new snack. 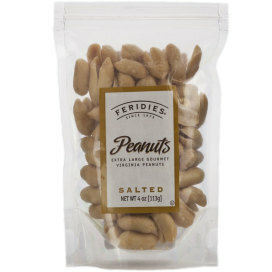 We use only the largest and crunchiest nuts harvested directly from Virginia soil, resulting in premium peanuts you'll enjoy down to the very last piece. Order a small sample pack or invest in multiple pounds of nuts to keep yourself well stocked throughout the year whenever the urge to snack strikes. We roast the raw peanuts in peanut oil to increase the flavor, then apply a light coating of salt. The results are salted nuts that aren't overwhelming but still salty enough to satisfy your cravings. 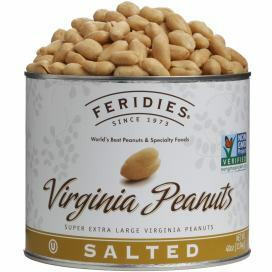 Virginia peanuts offer the most flavor and best texture of all American grown legumes because of the unique sandy loam soil found in the area. Each nut pod grows large in the loose soil, resulting in a premium peanut. 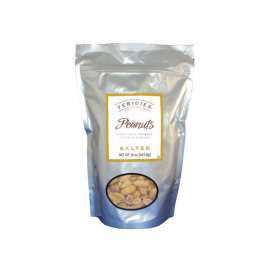 Stick with Virginia peanuts for all your snacking, baking, and cooking needs. They are OU Kosher Certified and Non-GMO Project Verified. You can feel good about giving FERIDIES!